Lately, I’ve been adding more herbs into my smoothies for the health benefits and taste. Mint is another one of my favorites because of the subtle flavor it imparts and the memories it conjures up of the mint chocolate chip ice cream I use to love as a kid. In my experience mint blends well into most smoothies. The health benefits of blueberries are more well known and I’ve covered them in other smoothie recipes; so I’m going to cover the magic of mint below. One of the oldest and most popular herbs, with dozens of species and hundreds of varieties, mint has a number medicinal properties. To be honest, I was a little surprised by just how many health benefits were associated with this common herb. Digestive Aid: Best known of its ability to sooth the digestive tract, mint is a good remedy for nausea, stomach aches, indigestion, heartburn, irritable bowel syndrome, and settling a nervous stomach. Mint also promotes healthy digestion by activating glands that secrete digestive enzymes. Healthy Skin: Skin disorders such as acne and pimples can be improved by consuming mint and rubbing on the infected area. Cleanse & Detox: Mint is great at cleaning the blood and stomach, and helping eliminate toxins from the body. Calming: Has calming properties and acts as a mild sedative. Antioxidants: The antioxidants in mint act as free radical scavengers and protect against the formation of cancerous cells. Anti-Fungal & Anti-Bacterial: Mint has been shown to inhibit the growth of many different types of bacteria and fungus. Other Benefits: You won’t experience these benefits by consuming mint in a smoothie, but inhaling its strong aroma helps with headaches and respiratory issues where congestion and soreness are present. 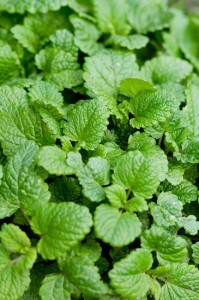 Mint has a cooling effect and helps open up congested passageways from colds, flu, and asthma. Mint teas and fresh mint infused water, which I’m actually drinking as I write this, are other good ways to get this super herb into your diet. Mint is growing abundantly here in Michigan. I loaded up during a recent foraging adventure and from the U-pick section of the local organic farm I get the bulk of my produce from. I’ve been using both fresh and dried and powdered mint in my smoothies. Feel free to add more mint than this recipe calls for, it’s really a personally preference on how minty you like things. You could use mint infused water in place of milk for a super duper mint smoothie. Enjoy! Any superfood you desire – such as cacao, maca, or bee pollen. Place all of the ingredients into your high speed blender and blend for around for 30-45 seconds or until the desired consistency is reached. Please leave a comment below if you try this minty blueberry smoothie. Happy Blending! Click here for my Mint Chocolate Chip smoothie recipe. I didn’t know mint had all these benefits! I learned several new health benefits of mint myself while doing research that I thought were pretty “cool”. mint is cool, and its benefits are certainly “cool” too! thanks for sharing!